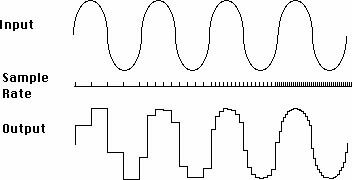 The sampling rate fixes the maximum limit on frequency response. The CD standard 44,1 kHz was a compromise and is meanwhile outdated. It may be inadequate for many types of material. Although the higher sampling rates encode audio outside the human hearing range, the net effect of higher sampling rate and conversion technology improves the audio quality within the range of normal human hearing. Higher sampling rate requires more storage space but that is no excuse because storage space is becoming continuously cheaper. Furthermore, one cannot foresee how the transferred audio may eventually be reused and what future restoration technologies might be capable of. IASA recommends a minimum sampling rate of 48 kHz. However, for some types of material, especially for tapes that suffer from unintended and undesirable artefacts such as noise, higher sampling rates, such as 96 kHz or even 192 kHz, may be useful. At the moment, 96 kHz may be regarded as a widely accepted standard. Set the sampling rate at the A/D converter and make sure that the settings of the soundcard and the recording software fully correspond. Mike Casey & Bruce Gordon: Sound Directions - Best Practices for Audio Preservation, pp. 11-13.